The ancient Aramaic alphabet is adapted from the Phoenician alphabet and became distinct from it by the 8th century BC. It was used to write the Aramaic language and had displaced the Paleo-Hebrew alphabet, itself a derivative of the Phoenician alphabet, for the writing of Hebrew. The letters all represent consonants, some of which are also used as matres lectionis to indicate long vowels. 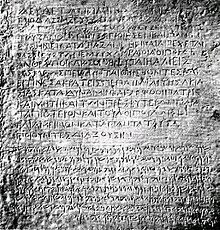 Bilingual Greek and Aramaic inscription by the Mauryan emperor Ashoka at Kandahar, Afghanistan, 3rd century BC. ^ a b c d e f g Daniels, Peter T.; Bright, William, eds. (1996). The World's Writing Systems. Oxford University Press, Inc. p. 89. ISBN 978-0195079937. ^ Inland Syria and the East-of-Jordan Region in the First Millennium BCE before the Assyrian Intrusions, Mark W. Chavalas, The Age of Solomon: Scholarship at the Turn of the Millennium, ed. Lowell K. Handy, (Brill, 1997), 169. ^ Greenfield, J.C. (1985). "Aramaic in the Achaemenid Empire". In Gershevitch, I. (ed.). The Cambridge History of Iran: Volume 2. Cambridge University Press. pp. 709–710. ^ Geiger, Wilhelm; Kuhn, Ernst (2002). "Grundriss der iranischen Philologie: Band I. Abteilung 1". Boston: Adamant: 249ff. ^ Naveh, Joseph; Shaked, Shaul (2006). Ancient Aramaic Documents from Bactria. Studies in the Khalili Collection. Oxford: Khalili Collections. ISBN 978-1-874780-74-8. ^ Babylonian beginnings: The origin of the cuneiform writing system in comparative perspective, Jerold S. Cooper, The First Writing: Script Invention as History and Process, ed. Stephen D. Houston, (Cambridge University Press, 2004), 58-59. ^ Tristan James Mabry, Nationalism, Language, and Muslim Exceptionalism, (University of Pennsylvania Press, 2015), 109. ^ George L. Campbell and Christopher Moseley, The Routledge Handbook of Scripts and Alphabets, (Routledge, 2012), 40. ^ Beach, Alastair (2 April 2010). "Easter Sunday: A Syrian bid to resurrect Aramaic, the language of Jesus Christ". Christian Science Monitor. Retrieved 2 April 2010. ^ Al Jazeera Documentary الجزيرة الوثائقية (11 February 2016). "أرض تحكي لغة المسيح". Retrieved 27 March 2018 – via YouTube.